I have a Heuchera 'Peach Flambe' (a.k.a. Coral Bells), which is thriving in my front garden. Of course now I wish I'd bought more than one ;) Not to worry... I intend to propagate it somehow. Maybe I'll try a cutting. That is a WONDERFUL photo! So vibrant and seeing the water drops on it makes it so neat looking. Coral Bells are so striking. I love the look of the plant and it's foliage, too. Thanks :) I love sneaking out with my camera after a rainfall to see what I can find. I have a macro lens so that makes close-ups easy. 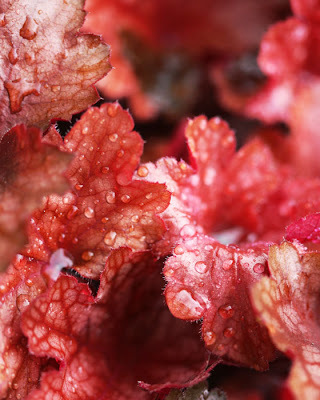 I think most florals look better with water droplets on them, and they're a lot of fun to shoot. I also un'Heuchera Peach Flambé beautiful, the colors of its leaves are very beautiful and I love the leaves with different colors and contrast. I have a small collection of heuchere are giving me enough satisfaction, although I live in an area apparently to their prohibitive. I really loved your photos, very good! !